Transparency and accountability initiatives have emerged as a potential solution to combat corruption and increase public benefits from the extractive sector in resource-abundant countries. The Extractive Industries Transparency Initiative (EITI) is one such initiative, through which 49 resource-rich countries have disclosed a cumulative 282 fiscal years of government revenues amounting to US$1.9 trillion since 2003. This paper explores the potential for promised benefits of increased disclosure to be realized, in the form of improved resource governance. Building on the social accountability literature, a framework is proposed and then applied to the Mongolian context to examine which stages of the framework work well, and which fail to perform. Two types of contracts are analyzed, water usage agreements and community benefit-sharing agreements. 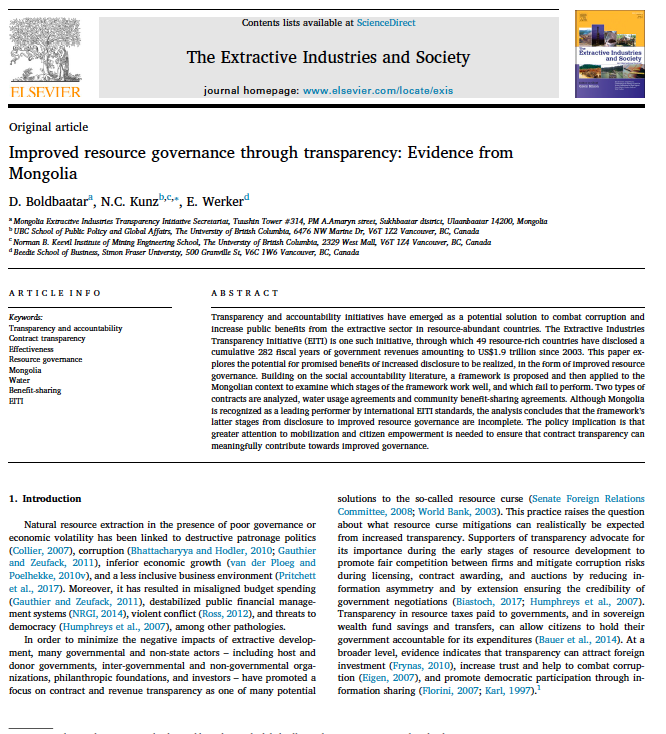 Although Mongolia is recognized as a leading performer by international EITI standards, the analysis concludes that the framework’s latter stages from disclosure to improved resource governance are incomplete. The policy implication is that greater attention to mobilization and citizen empowerment is needed to ensure that contract transparency can meaningfully contribute towards improved governance.